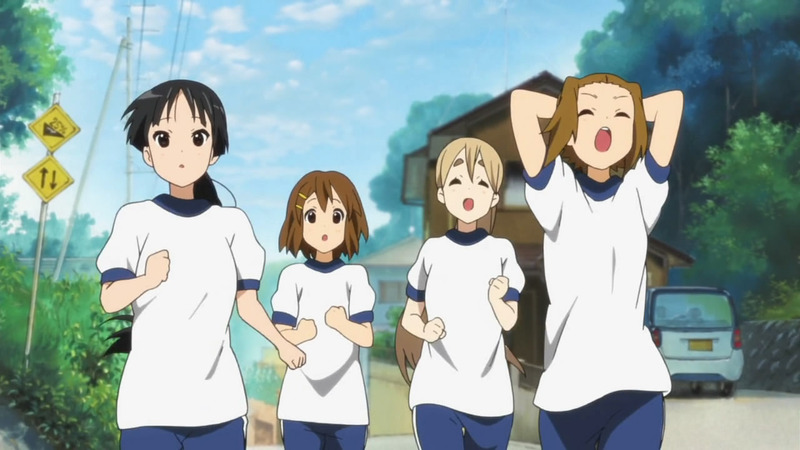 I can’t say it’s surprisingly to find out that a group of girls who sit around eating cake and sipping tea all day isn’t the most athletic bunch, but Yui takes it to a whole all new level of struggling during a 4-5 kilometer marathon run. She doesn’t seem unfamiliar with the whole mind over matter ideology though, as the risk of not getting the promised sweet red-bean soup sent her legs into high gear. 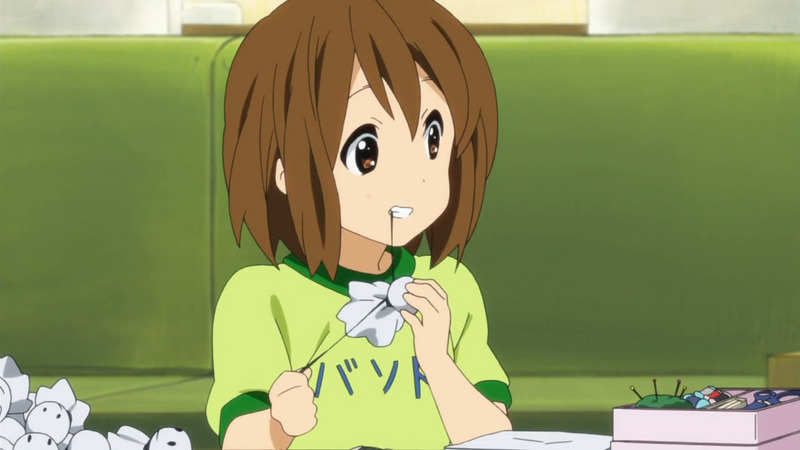 Food, it’s always got to be food with Yui. 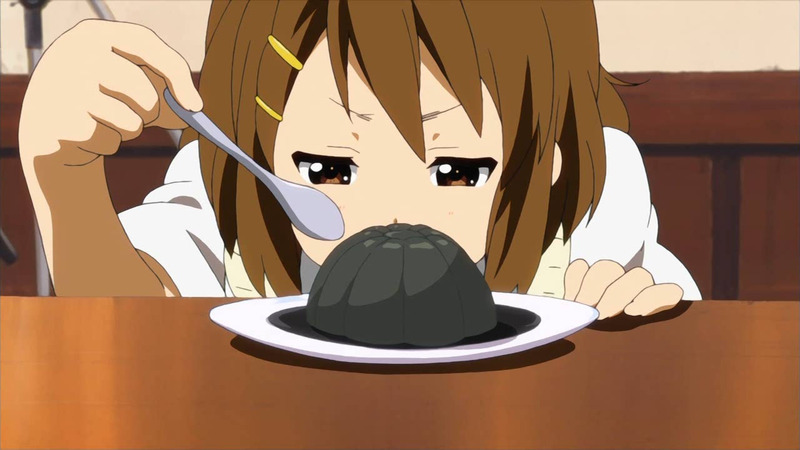 However, just when I thought there were no limits to this girl’s love of desserts, Mugi’s kombu and hijiki flavored blancmange quickly disproved that idea. 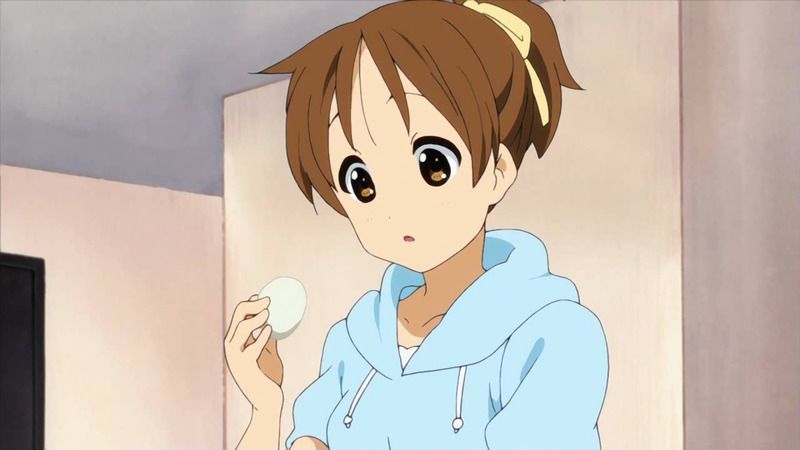 Naturally, it’s all about the flavor and not the nutritional aspect with Yui. 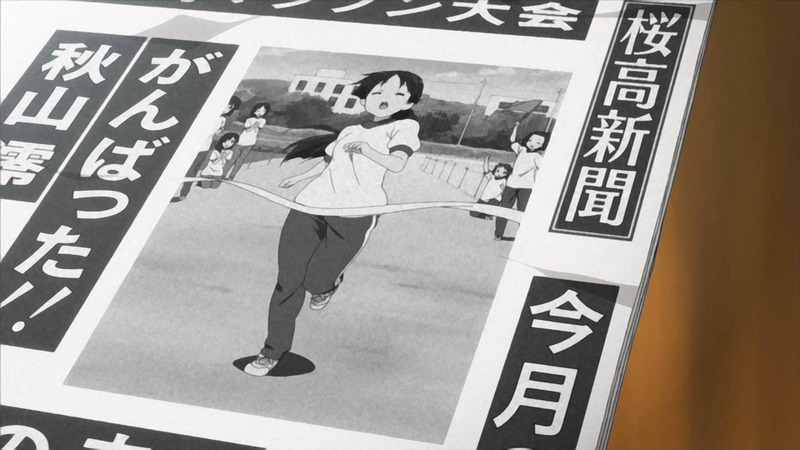 Sawako didn’t seem like much of a fan either, though she was pretty gung-ho about the marathon and all the visual temptations along the course (i.e. 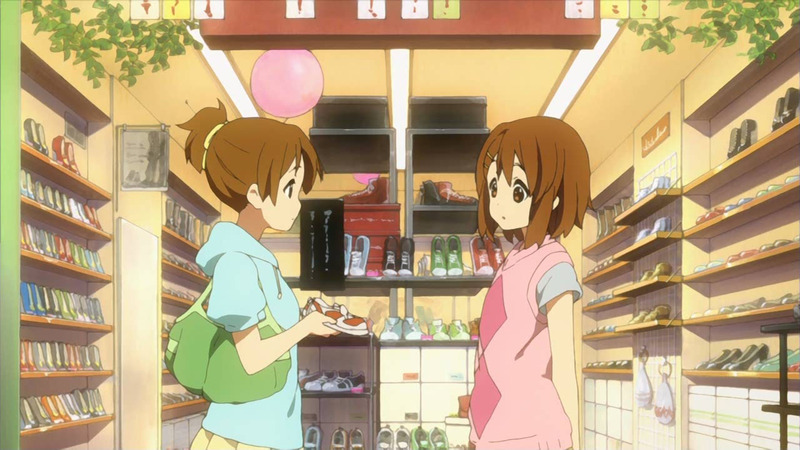 cake shops and stores with cute stuff). 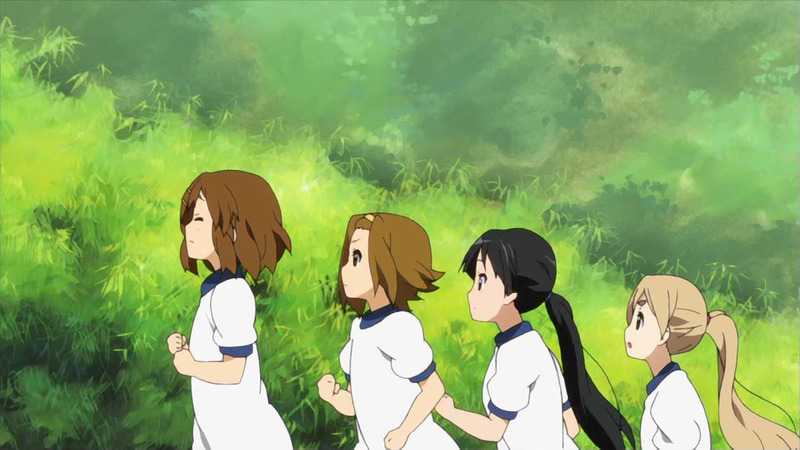 In retrospect, there wasn’t a lot to this episode outside of the marathon itself and Yui not looking forward to it one bit, but somehow I was pretty amused from start to finish. 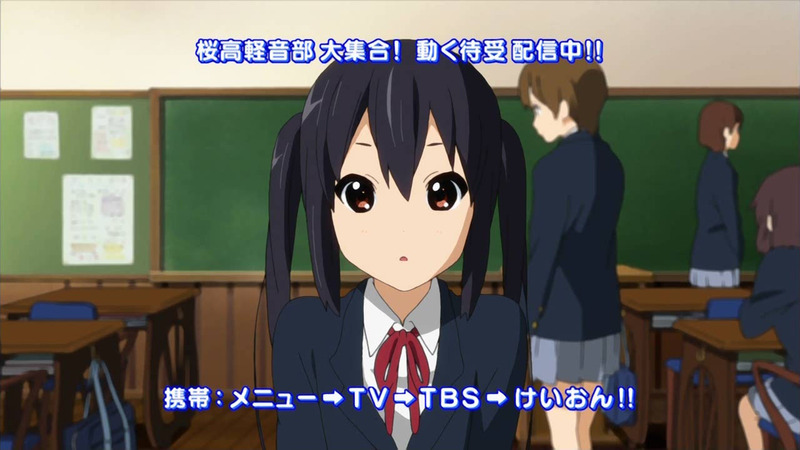 The return to school after the summer break with Azusa all radiant about school life with everyone again did bring out quite a reaction. 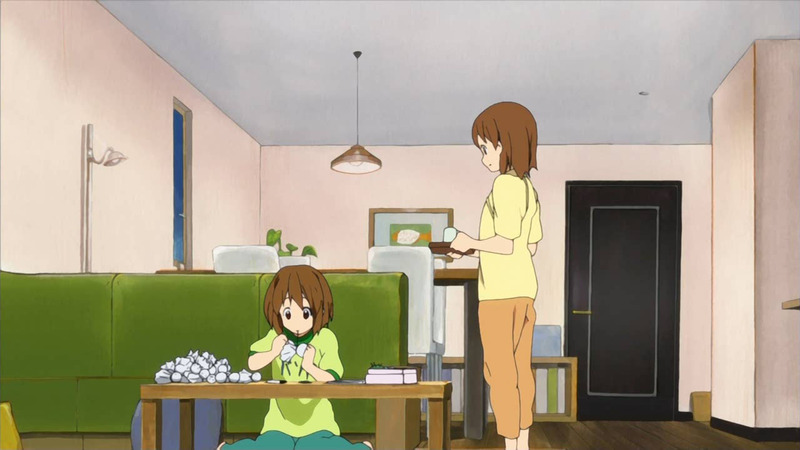 Following that, I thought it was pretty cute how Yui actually tried hanging Teru teru bouzu upside-down to bring about rain, though it was somewhat creepy too now that I think about it. 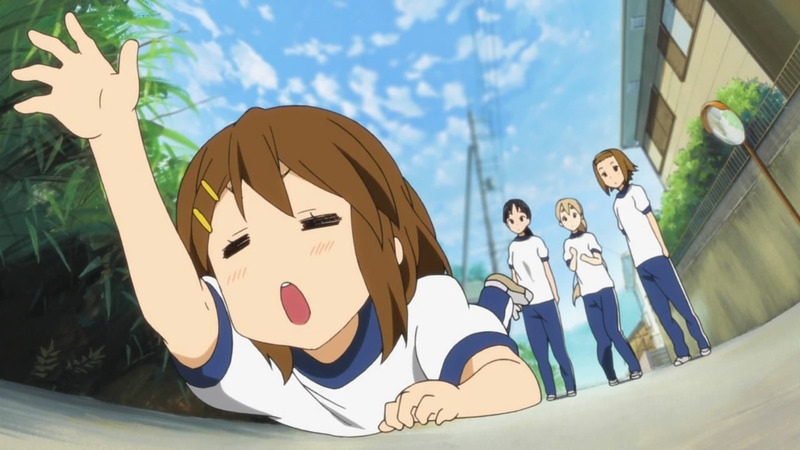 In any case, I don’t think I’ll ever quite get tired of seeing Yui reach the breaking point before things even got underway or during the actual climb up the hill from Hell. In comparison to Yui sweating all her cake juices out, I’m pretty amazed that Jun didn’t fall terribly behind and go outright missing. 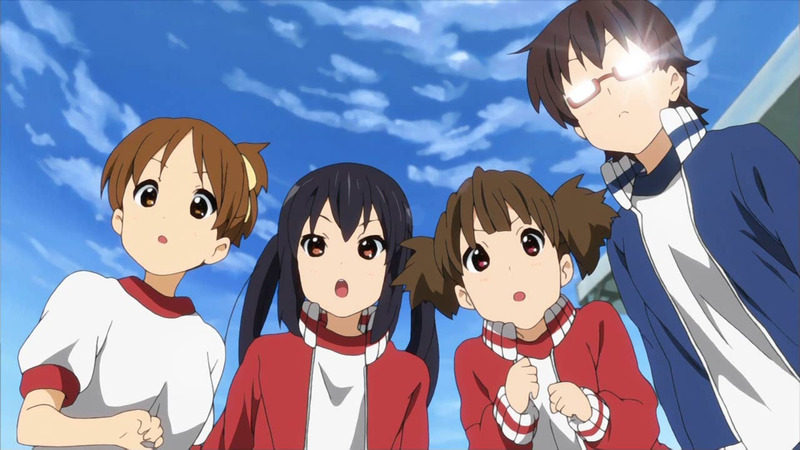 Given their struggles, it looked like a shoo-in that they would come dead last, but that honor was reserved for Mio regardless of how much she wanted to avoid it. 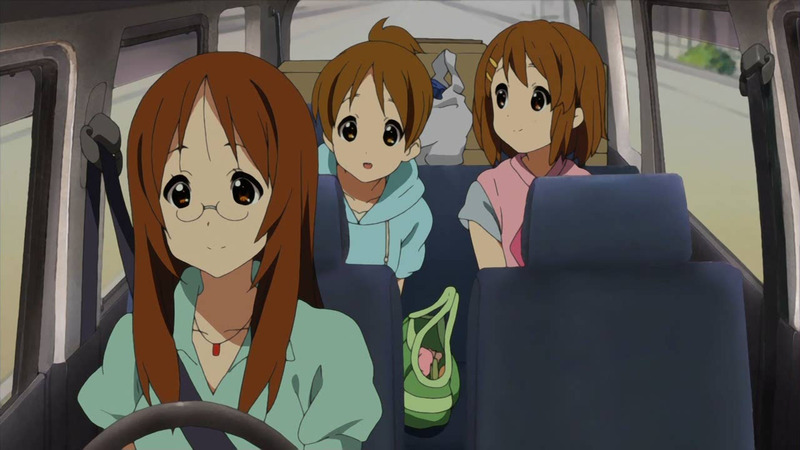 Talk about getting the short end of the stick after everyone went out of their way searching for Yui. 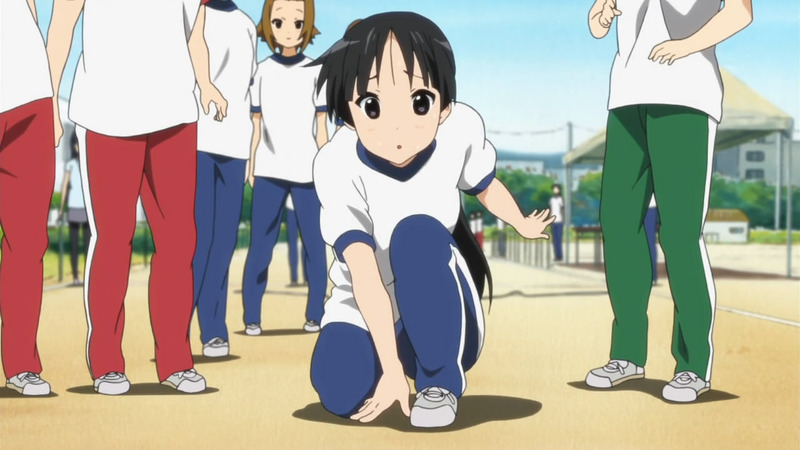 Mio did look pretty slick with that tumble she unexpectedly pulled off to say herself from a full-out face plant, especially with the whole ponytail look going on. * Note: I more or less collapsed from exhaustion after work today, hence the late post. The last time I recall feeling that tired was back in university during final projects. Anyway, I’ll probably have the RAINBOW post out much later today. 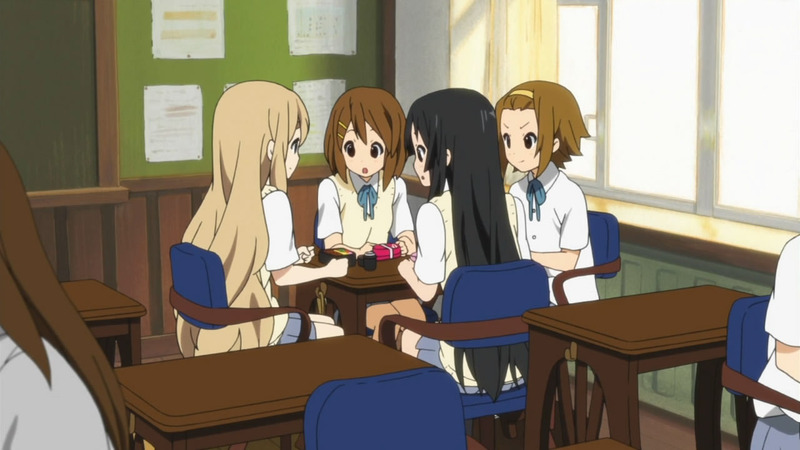 They’re all amateurs and only learned how to play two songs, “Watashi no Koi wa Hotchkiss” and “Fuwa Fuwa Time”. “Don’t say ‘lazy’” was performed to a karaoke backtrack. 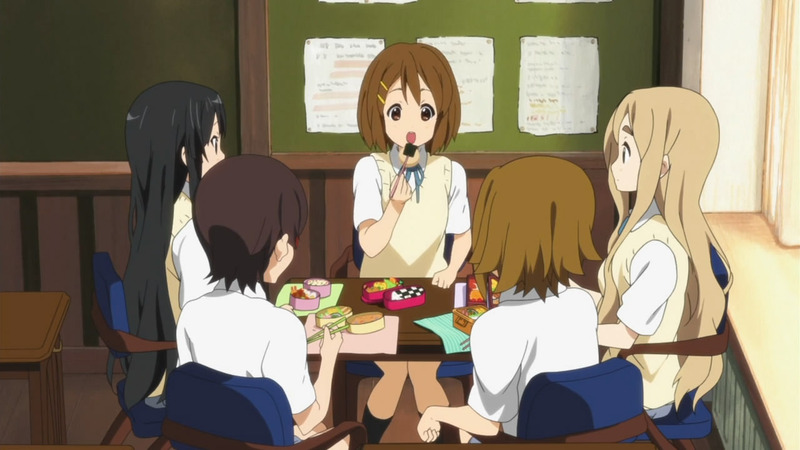 As far as I’m aware, Kotobuki Minako (Mugi) is the only one with any sort of a musical background since her mother’s a piano teacher. (Funny how well that worked out for her.) 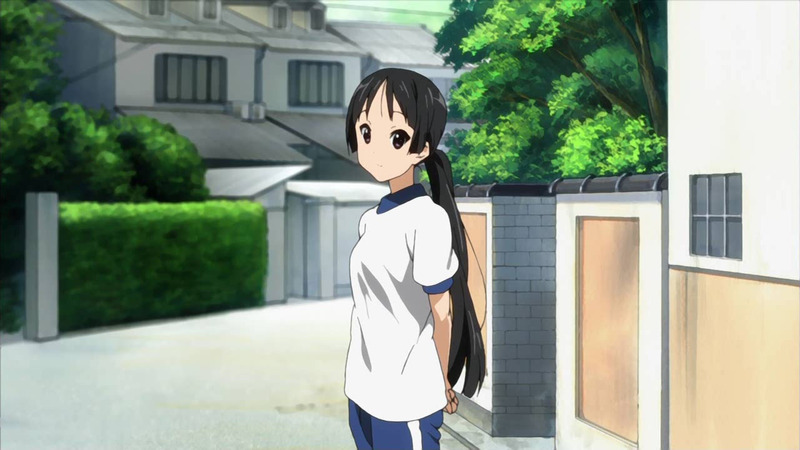 Hikasa Youko (Mio) is actually right-handed, but learned to play the bass left-handed to fit Mio’s character. We get to hear Minako a bit more in sphere at least, including their new single for the opening theme of Asobi ni Iku yo. I was wondering if she’d ever see a solo release though. 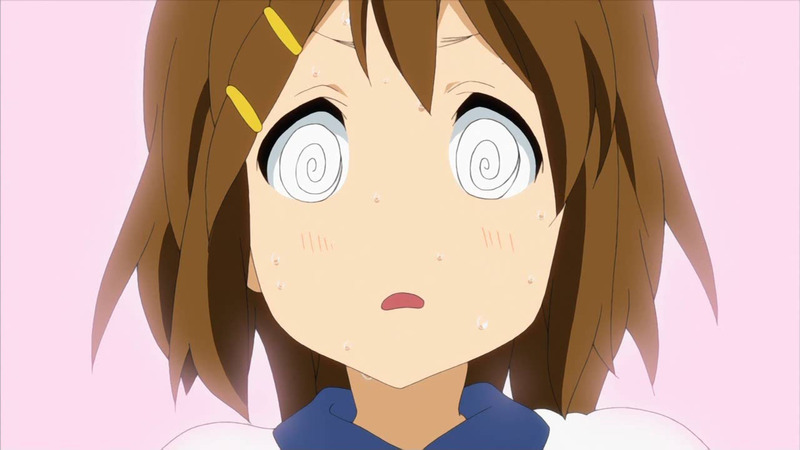 Say, how about Satomi Satou and Ayana Taketatsu… do they have experience on their respective instruments? 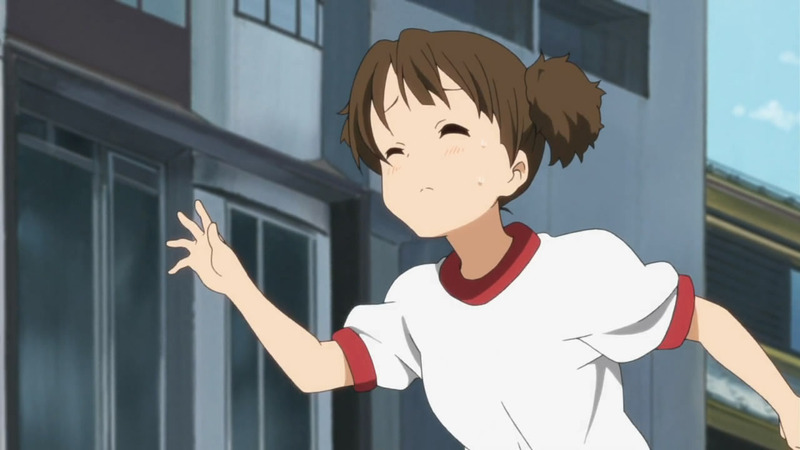 Minako is cute but I have a big soft spot for Aki. 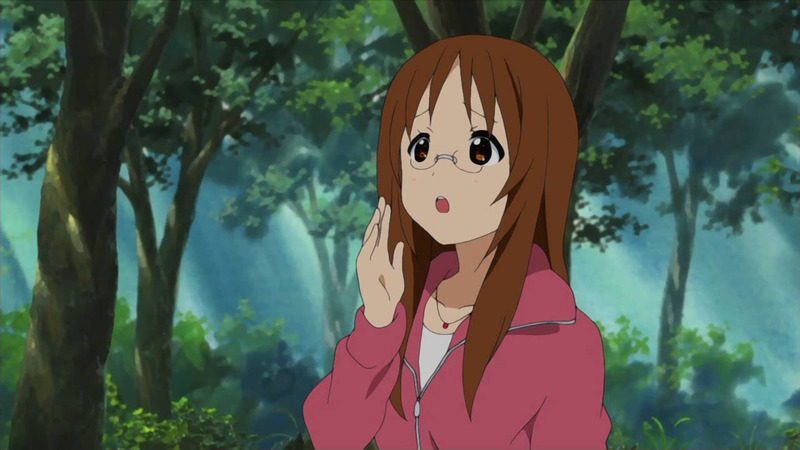 I also find Ayana real adorable. Satomi is seemingly perky and Yoko’s voice is one of my favs. Not sure if you’re feeling a bad heat wave where you’re at, Divine. Here, without an a/c, it’s just plain unbearable. It’s been alright this week, but last week was pretty damn hot. Really enjoyed “Don’t say lazy”. Yeah, it’s her pencil case. I originally thought it was her cell phone. I’ve been listening to Hotchkiss ever since I got my hands on the concert. Hikasa’s live voice totally won me over. Now, if it’s not difficult, maybe someone can make mp3 of all their performances? i been waiting for the albums for Utauyo!! MIRACLE and No,Thank you! which is release on the 4 of August i can’t wait for the new albums to come out! 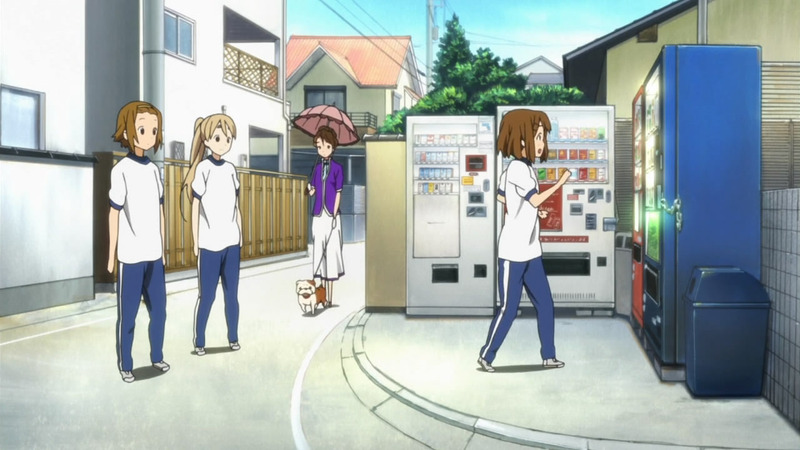 Ui probably has a telepathic link to her sister, otherwise I cannot think how she managed to find Yui in no time. 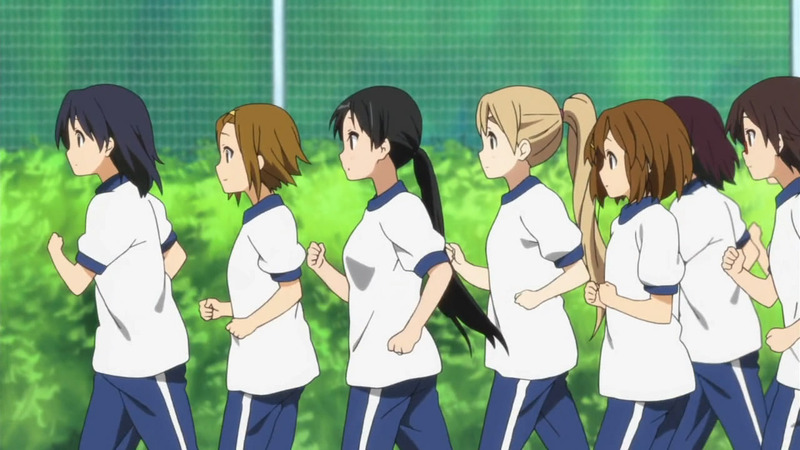 This episode was back to its slower-than-usual pace. 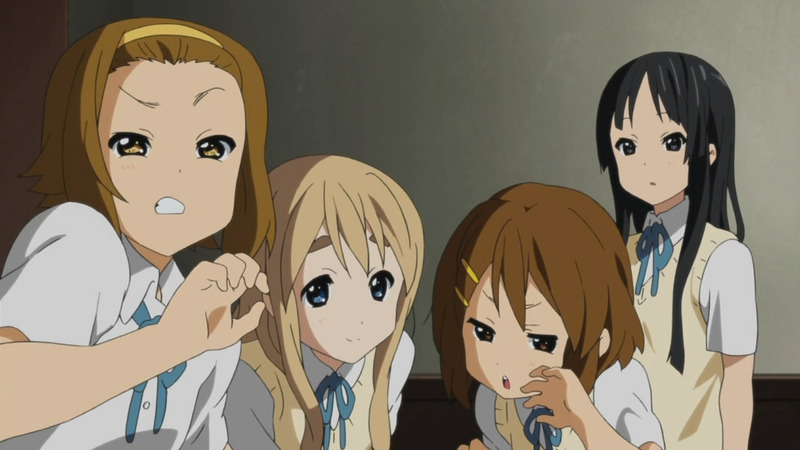 It’s kind of… what was that word you K-On haters like to use a lot… ah, yes, “boring”, this week can indeed be described as quite “boring” for once, compared to the average K-On episodes. Maybe there was too much laugh-inducing moments last week that the writers had to cool down a bit. Still, there’re positives. I’m still grinning from ear to ear with the girls’ antics by the end, Yui in particular, with Aki being top par as usual in playing her eccentric cuteness. Made me think how lucky some people are just to even get one big chance in such an event. 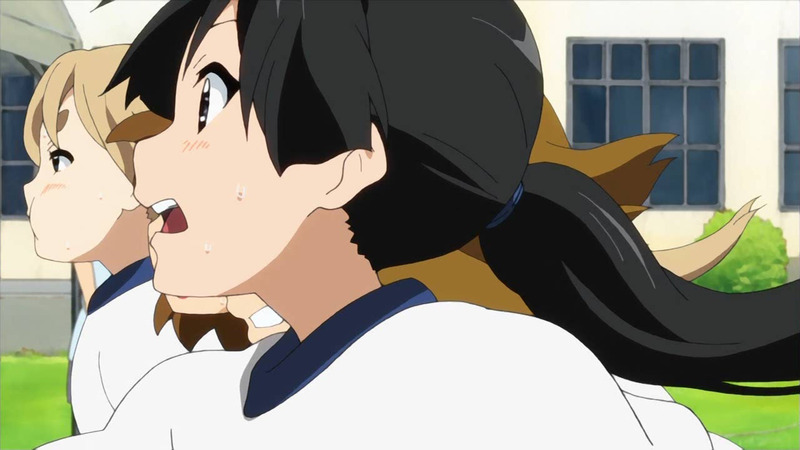 Anyway.. KyoAni pulled another weird crap… I lol’d so hard at the slow-mo reverse scene. Seriously… WHAT THE HELL!? Yep loved her voice. Back then I was actually surprised when I it randomly played on my playlist. She actually has quite a good singing voice. 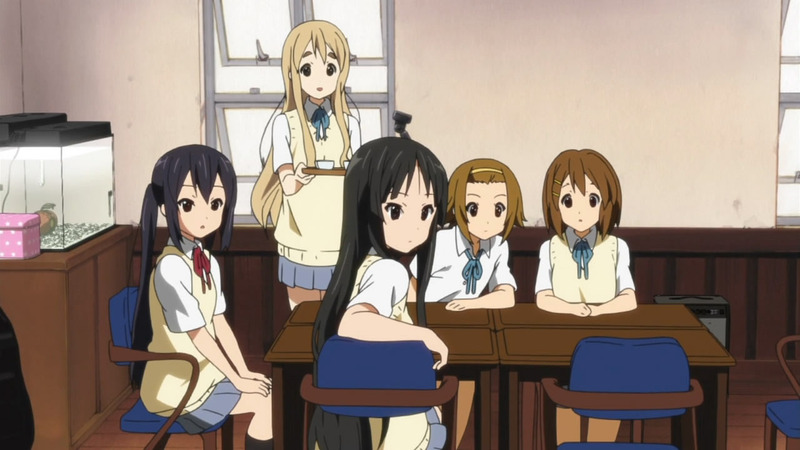 Things which I was really looking forward to was Azusa’s song, Yui’s Song(Giita ni Kubittake), and Let’s Go! 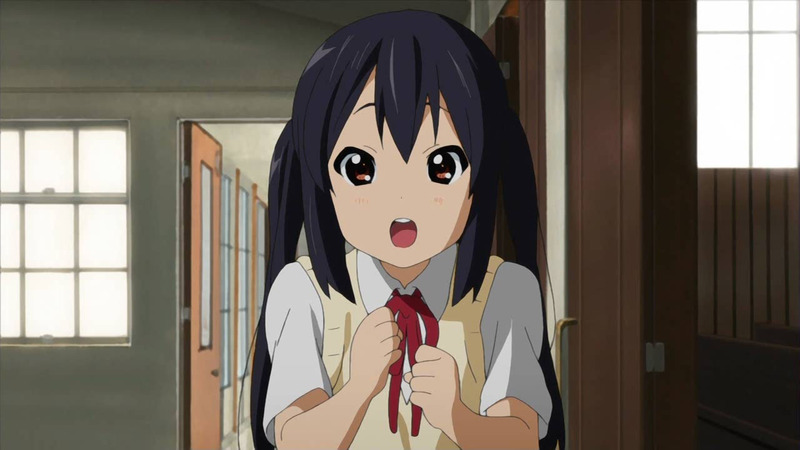 Whichever of the two tracks from Azusa’s image song since they’re both awesome. Not to mention how catchy this one is. Man we told you! Take care of yourself. Don’t go dying on us. Rest and get well soon. My take in the songs is that they are postponing then until the end of the show to end in a high note. oh well have to wait a full week again. I spent some time to get up to date with Katanagatari. I hate episode 3 by the senseless kill. However, I’m so upset by episode seven. 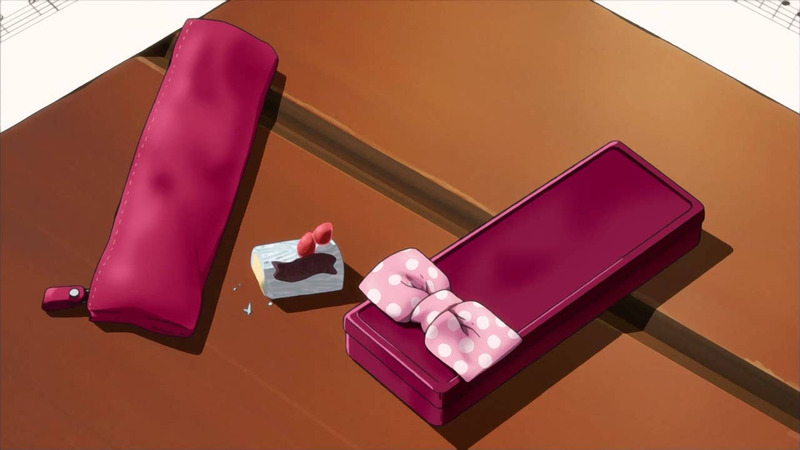 Why Shichika had to kill Nanami. His own sister! Boo Lol She was a cool character and I liked her. The way Togame is leading her sword is bad. They are morphing into what they are trying to fix (evil bad guys). Not going to watch for 3 or 4 months; but I hope they die at the end too. 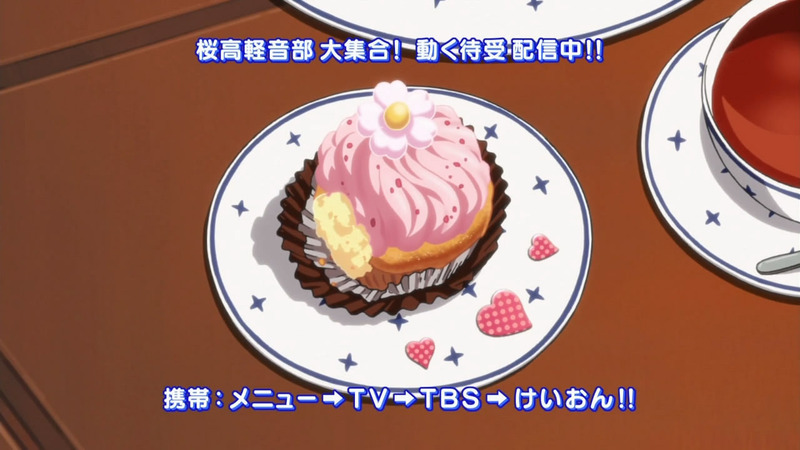 Thats the more of a reason why I like it so much :D, and as Nanami said, Shichika is becoming softer and softer over time, ep 3 was just to show his initial attitude. And Nanami apparently wanted to die so u cant blame anyone for that. UPS, Modem, UTP, and Laptop. Watched up to 15 minutes of the live streaming. I don’t want to be rude but those costumes the VA’s wore at the concert are just weird. It works fine in an anime but in real life…. not so much. Just goes to show that there is a fine line dividing fantasy and reality. I learned that the hard way at Sankaku. OMG! 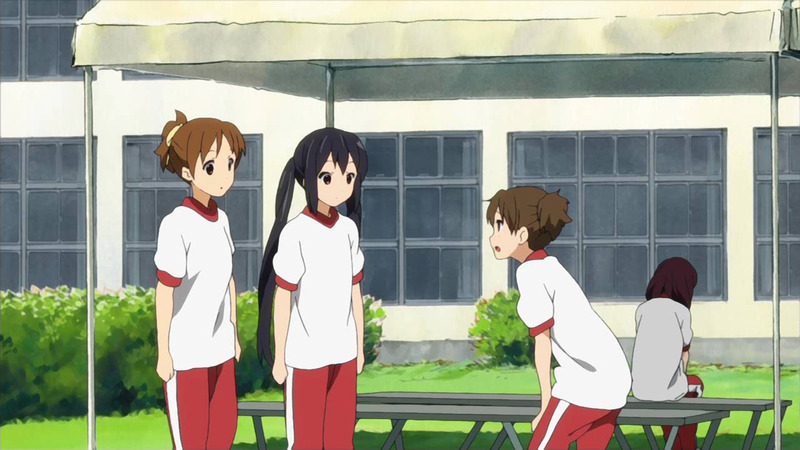 Both Mio and Mugi ponytail looks in one episode! My heart exploded. @Divine Rest up my friend. We can’t have a dead blogger flinged around. Oh noes! 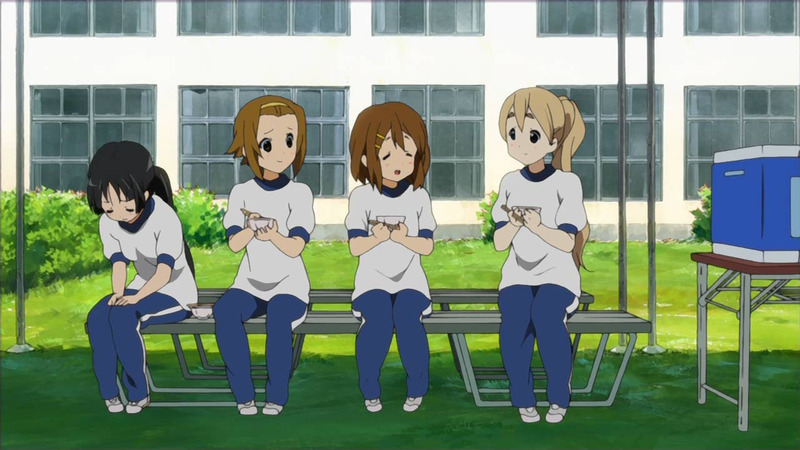 Summer’s over and no training camp at Mugi’s most palatial vacation home! 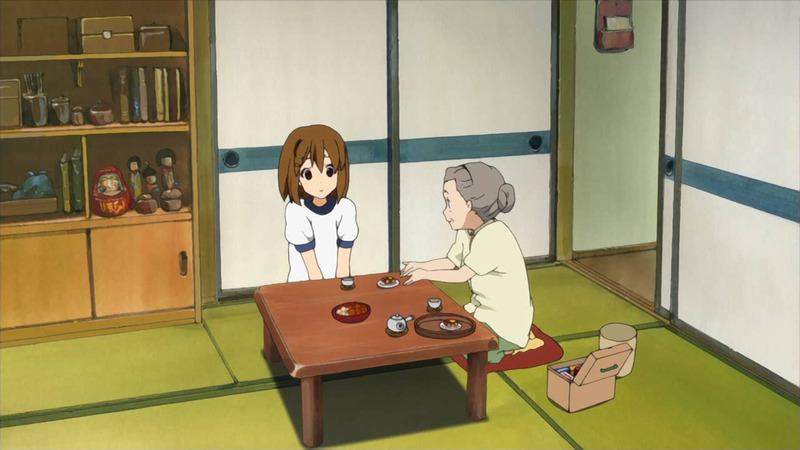 *sob* (I was looking forward to seeing it after the first two camps where Mugi complains she couldn’t get the home she wanted!). 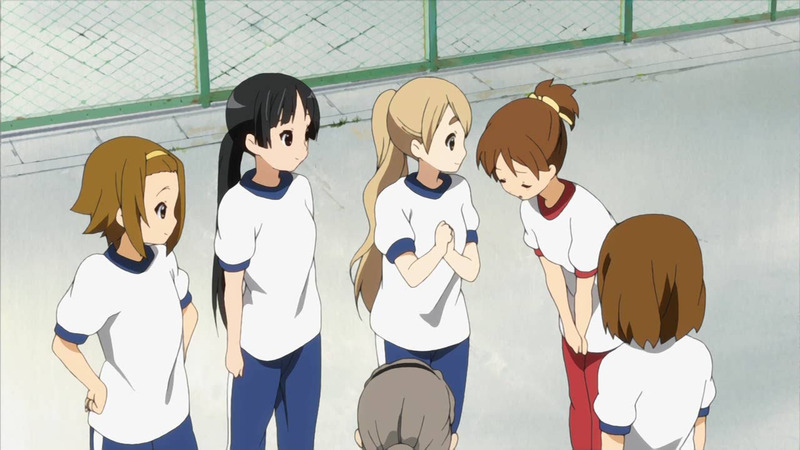 Perhaps they’ll go for Christmas/New Years to train for HTT’s farewell concert. 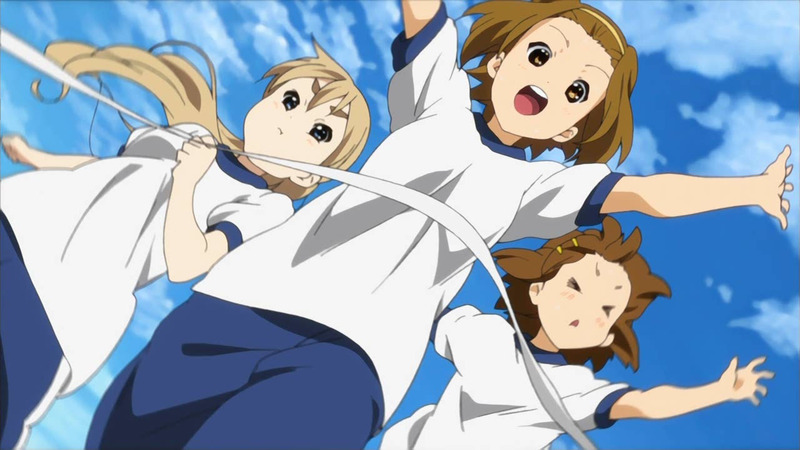 I thought they would cross the finish line together, but great acrobatic skills from Mio. 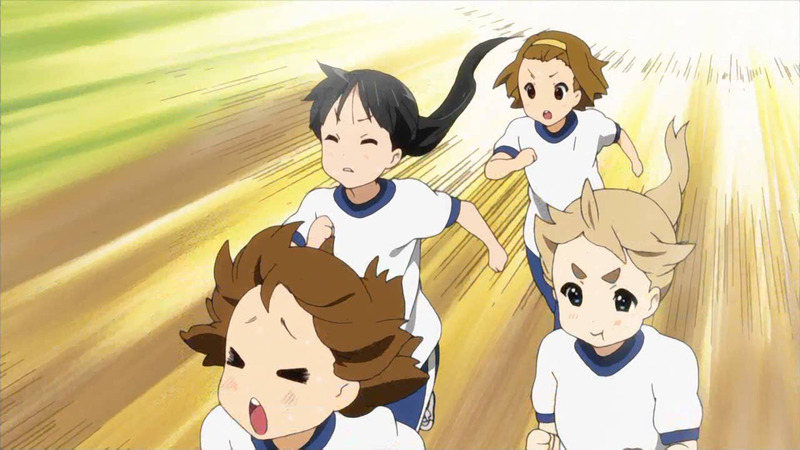 Yui running for food, Mio running to avoid attention are just like them. 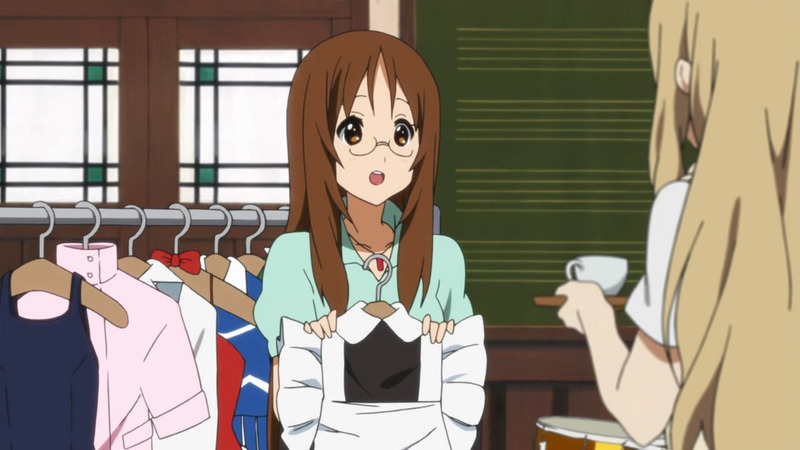 Poor Sawako. YES! I’m stoked that you’re covering the live!! I love you Divine! As for those two videos, I’m actually very impressed seeing as they’re all amateurs. Somehow, Toyosaki Aki’s voice was more refreshing this time, and it’s fun to watch them try and act the way the characters do in the show. My only disappointment was their costumes. 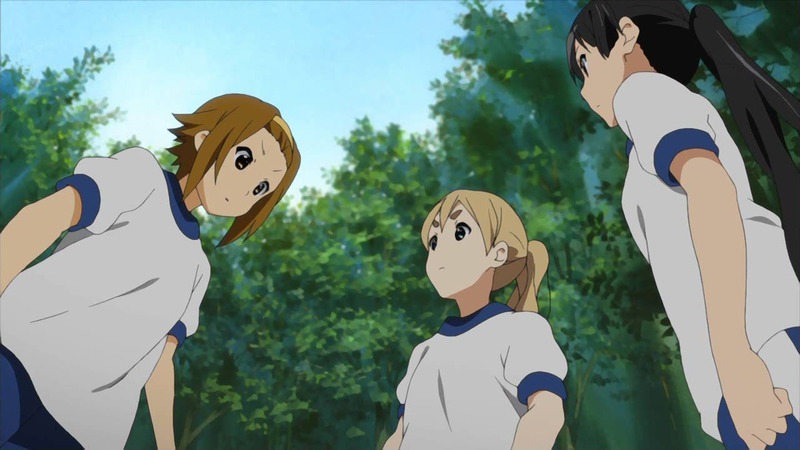 I wish they’d played in their seifuku, and I REALLY wish we could have seen them in the Don’t Say Lazy costumes. It would have been awesome to see them recreate the original ending. Still, can’t wait for that post! And good episode too lol. Would Most Likely have all of my money. 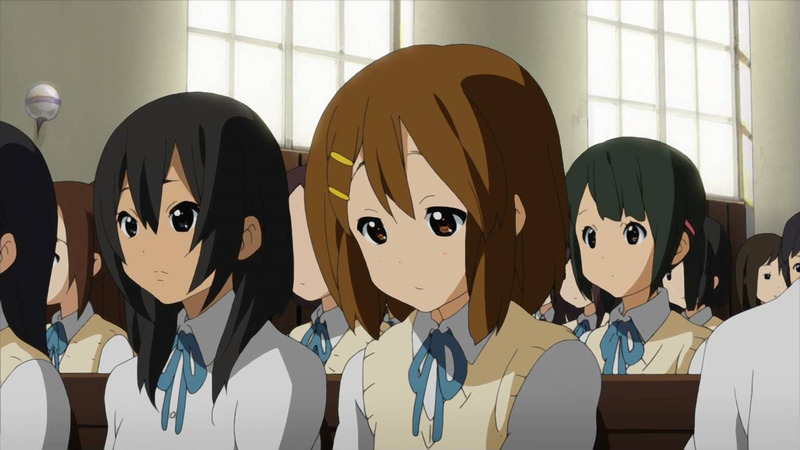 K-ON LIVE?! AND ACTUALLY PLAYING THE INSTRUMENTS?!!!!!!?!? I hope things are okay Divine, you’ve been doing a top notch job. 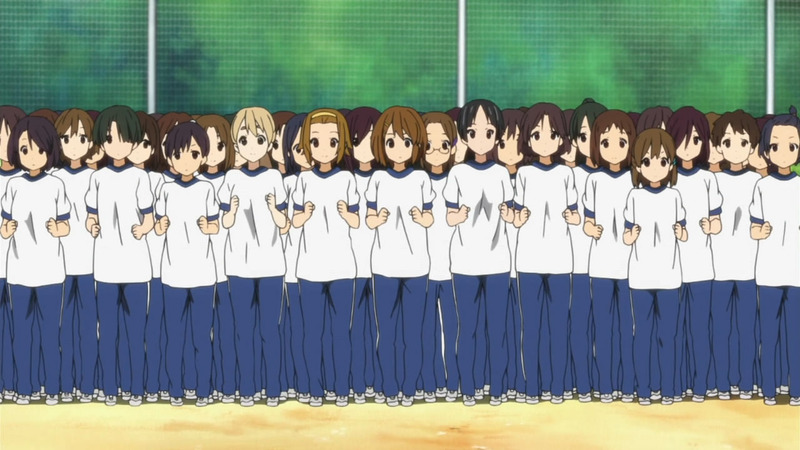 I don’t know why people haven’t been enjoying K-ON!! this season, I’ve really enjoyed it. I would be interested in listening to what people’s opinions are. And, people who wear glasses are awesome. July 15, 2010 at 2:22 pmK.K. 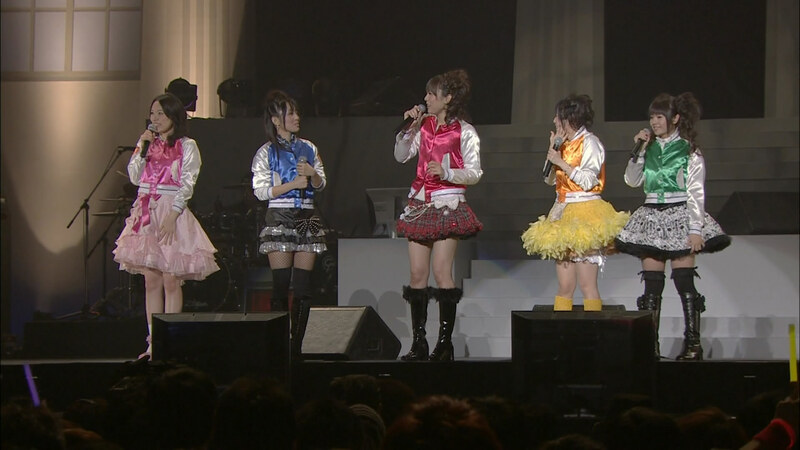 It’s really funny that the seiyuu beat their characters to Yokohama Arena, hahaha. Did they ever mention Yokohama Arena? I thought their only goal was Budokan. Yokohama Arena is actually a step up though since it’s a larger and more modern venue. 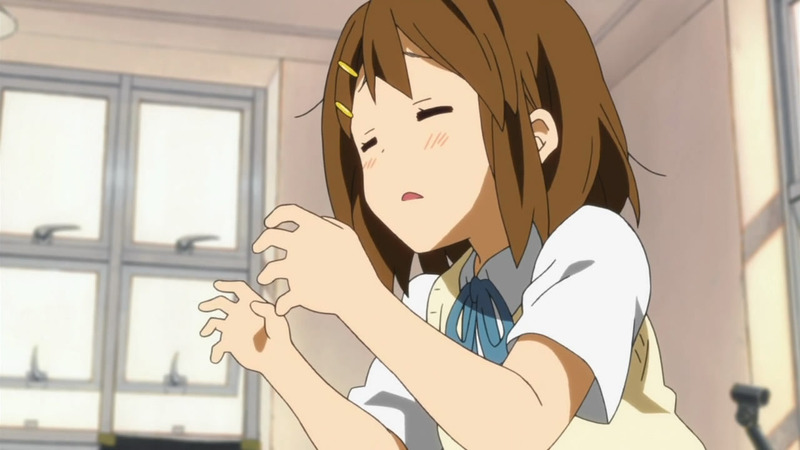 Yui has a Rice Cake Seed Mode apparently. 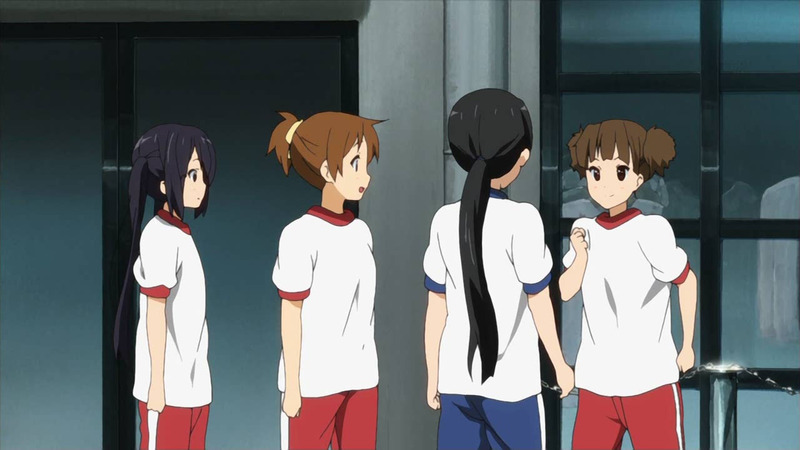 Still, it was a pretty fun episode and Yui’s short attention span was definitely entertaining.